Recently, RavenPack hosted its 7th Annual Research Symposium in New York titled “Generation AI: The New Data-driven Investor”. Close to 1,000 finance professionals registered to attend the event, an increase of nearly 50% from last year’s event. Surely, artificial intelligence and big data continues to grab the attention of the investment industry. The event took place on September 12, 2018 at the Convene Center by Times Square in Midtown, New York. In case you weren't able to attend and listen to the valuable insights from our long list of excellent speakers, presentation slides and video recordings have now been made available here. You can watch this highlights video to learn more about the event, who attended, what were the topics and the main takeaways in less than 2 minutes. The agenda included speakers from Citigroup, Bank of America Merrill Lynch, MSCI & other top firms. They covered the most promising areas of machine learning and AI in finance, and presented several real world examples of how alternative data and machine learning is used in the investment process. It was a full day event with several standalone speaking sessions and a real “Battle of the Panels” with Tim Harrington, CEO at Battlefin Group, moderating the panel “Big Data, Big Impact: How Data is Reshaping the Modern Investor”, and Bartt Kellermann, Founder and CEO of Battle of the Quants, moderating the thought provoking panel “Will Artificial Intelligence Create a ‘Useless Class’ of Financial Professionals?”. Several attendees shared their excitement and views on social media throughout the day. Artificial Intelligence and Big Data both being key topics of the event, our CEO Armando Gonzalez made a brilliant description of how it all started with the introduction of the punch card. Fun fact from #GenerationAI Big data started in 1890 with the Hollerith machine, which electronically tabulated the US Census’ punch cards! He then went on to discuss how, in the future, we could expect the world to be divided into new classes of the “haves” and the “have-no-data” as part of the revolution stage. However, when the audience were asked “Do you think the society will become better or worse from increased automation and AI?”, 76% said “Better”. So no Skynet just yet! The event featured a keynote on “The World of Alphas” by Nitish Maini, General Manager of WorldQuant’s Virtual Research Center. Nitish provided an exciting look into their alpha factory and discussed how WorldQuant’s success can be contributed to the company’s unique ability to combine humans and machines in their investment process. Next, on behalf of RavenPack, I had the chance to present some of the recent research done by the RavenPack Data Science team. In particular, I showcased how intraday news patterns should dictate the construction and implementation of sentiment strategies - resulting in greater profitability trading around the market open vs. the close due to closer news proximity. Dr. Ronnie Shah, Director and Head of U.S. Quantitative Research and Quantitative Investment Solutions at Deutsche Bank, followed up with an engaging talk about their use of machine learning in estimating “fundamental acceleration”, a measure which can help improve risk-adjusted performance of typical value or “1/P” strategies by up to 80%. 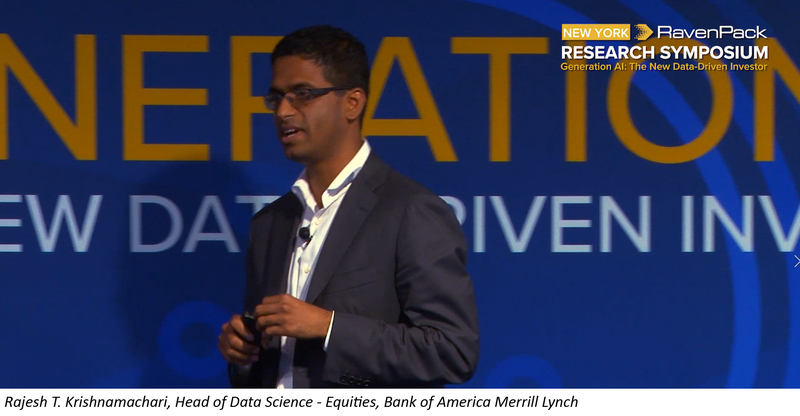 Rajesh T. Krishnamachari, Head of Data Science - Equities at Bank of America Merrill Lynch went on to clarify and discuss whether most value in the investment process can be contributed to new data vis-a-vis new analysis techniques. He also presented some of the areas and regimes that he believed had the most and least potential of getting disrupted by big data and machine learning. We then had the first panel of the day, focusing on “Big Data, Big Impact: How Data is Reshaping Finance”. The moderator, Tim Harrington, did an excellent job of engaging the audience and panelists in a lively discussion. The panel included: Matei Zatreanu, CEO and Founder of System2; Milind Sharma, CEO of QuantZ Machine Intelligence Technologies; Rajesh Krishnamachari from Bank of America Merrill Lynch and myself. We discussed how the emergence of AI and big data had impacted our workday as quants and the firms that we work for. We also covered topics related to data sourcing and data evaluation. In particular, someone from the audience asked a fascinating question: “how much time should I spend on feature engineering when testing new datasets?”. You can listen to the answers and the general panel discussion here. Dr. George Bonne, Executive Director of Equity Factor Research at MSCI, presented on his latest research on news sentiment signals in the framework of the Barra equity factor models. In particular, he showcased how the latest version of the RavenPack dataset outperforms the previous version across various holding periods (of up to 3 months) and investment universes (US and Europe). Basically, George left the audience with no excuse not to look at RavenPack data. One of my favorite talks of the day was given by Dr. Matthew Dixon, Assistant Professor of Finance and Statistics at Illinois Institute of Technology. In his talk, “The Neural Networks Survival Kit for Quants”, he used various examples from portfolio construction to algorithmic trading to explain neural networks as a non-parametric econometrics technique. Compellingly, he highlighted that, at their core, deep neural networks, are nothing more than linear regressions and when applying different types of regularization, we simply get Lasso or Ridge. I highly recommend this intriguing talk. I had also personally been looking forward to the presentation by Hong Li, Managing Director and Head of U.S. Equity Quantitative Research at Citi Research. He presented on the latest research on RavenPack data for fundamental investing. In particular, he found that buying stocks with recent CAPEX announcements, using RavenPack data, outperform the market over the long run while high CAPEX stocks based on accounting reports tend to underperform. With this targeted approach, he found value in news data over 3 - 6 month horizons. You can read my comments on the methodology used and high level results in my recent blog post CitiBank's take on CAPEX announcement strategies using RavenPack data. We finished off an exciting day with an enlightening panel on artificial intelligence: “Will Artificial Intelligence Create a ‘Useless Class’ of Financial Professionals?”, moderated by Bartt Kellermann. He was joined by panelists Matthew Dixon; Sara Castellanos, Emerging Technologies Reporter at The Wall Street Journal; and Igor Halperin, Research Professor of Financial Machine Learning from the NYU Tandon School of Engineering. Panelists were asked their opinions on the winning skillset of the future with the presence of AI. Will finance professionals be pushed out of employment by intelligent machines or will we find new roles to fulfill? Will AI increase polarization in society - making capital even more important than today? Is introducing a basic income guarantee the answer? Listen to the panel discuss these topics. After a long but enriching day, we finished off with a reception of canapes and well-deserved drinks, where participants had the opportunity to network. To ensure that no one misses out, I’m adding the link where you can request slides and full videos.